Not to be confused with Bernalillo, New Mexico. Bernalillo County is the most populous county in the U.S. state of New Mexico. As of the 2010 census, the population was 662,564. The county seat, Albuquerque, is the most populous city in New Mexico. 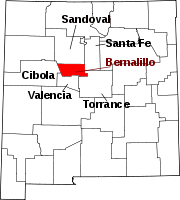 Bernalillo County is the central county of the Albuquerque, NM Metropolitan Statistical Area. Bernalillo County was one of seven partidos established during Mexican rule; in 1852, within two years of the creation of the New Mexico Territory, Bernalillo became one of that territory's nine original counties. In 1876, it absorbed Santa Ana County. In 1906, years after the Land Revision Act of 1891 provided for the setting aside of forest reserves, the parts of Bernalillo County currently known as Cibola National Forest were established as reserves. USS LST-306, a World War II tank landing ship which participated in the Allied invasion of Italy, was renamed USS Bernalillo County in 1955. Sandia Mountain Wilderness was created in 1978 and the Petroglyph National Monument was established in June 1990. According to the U.S. Census Bureau, the county has a total area of 1,167 square miles (3,020 km2), of which 1,161 square miles (3,010 km2) is land and 6.4 square miles (17 km2) (0.5%) is water. It is the third-smallest county in New Mexico by area. Bernalillo County is in central New Mexico, and "stretches from the East Mountain area (just east of the Sandia Mountains) to the Volcano Cliffs on the west mesa." Median Household Income by Census Tract Block Group across Albuquerque metro. As of the census of 2000, there were 556,678 people, 220,936 households, and 141,178 families residing in the county, making Bernalillo the most populous county in the state. The population density was 477 people per square mile (184/km²). There were 239,074 housing units at an average density of 205 per square mile (79/km²). The racial makeup of the county was 70.75% White, 2.77% Black or African American, 4.16% Native American, 1.93% Asian, 0.10% Pacific Islander, 16.07% from other races, and 4.22% from two or more races. 41.96% of the population were Hispanic or Latino of any race. There were 220,936 households out of which 31.40% had children under the age of 18 living with them, 46.00% were married couples living together, 12.90% had a female householder with no husband present, and 36.10% were non-families. 28.50% of all households were made up of individuals and 7.90% had someone living alone who was 65 years of age or older. The average household size was 2.47 and the average family size was 3.06. In the county, the population was spread out with 25.30% under the age of 18, 10.30% from 18 to 24, 30.40% from 25 to 44, 22.40% from 45 to 64, and 11.50% who were 65 years of age or older. The median age was 35 years. For every 100 females there were 95.50 males. For every 100 females age 18 and over, there were 92.90 males. The median income for a household in the county was $38,788, and the median income for a family was $46,613. Males had a median income of $33,720 versus $26,318 for females. The per capita income for the county was $20,790. About 10.20% of families and 13.70% of the population were below the poverty line, including 17.90% of those under age 18 and 9.10% of those age 65 or over. Of the 266,000 households, 31.9% had children under the age of 18 living with them, 41.4% were married couples living together, 14.1% had a female householder with no husband present, 38.3% were non-families, and 30.4% of all households were made up of individuals. The average household size was 2.45 and the average family size was 3.07. The median age was 35.8 years. The median income for a household in the county was $47,481 and the median income for a family was $59,809. Males had a median income of $42,189 versus $34,432 for females. The per capita income for the county was $26,143. About 11.8% of families and 15.6% of the population were below the poverty line, including 22.8% of those under age 18 and 9.8% of those age 65 or over. Deb Haaland (D) is the representative for the 1st Congressional District. In presidential elections prior to 1992, Bernalillo County primarily voted for Republican Party candidates, only supporting three Democratic candidates in six elections total. (Franklin D. Roosevelt four times, Harry S. Truman & Lyndon B. Johnson once each). From 1992 on, the county has backed Democratic Party candidates in every presidential election. While the margins were relatively narrow from 1992 to 2004, since then the county has tilted strongly Democratic similar to many urban counties nationwide. 1988 was the last year the county backed a Republican Candidate. A local geographical oddity is that the town of Bernalillo, north of Albuquerque, is not actually in Bernalillo County. It is the county seat of Sandoval County. ^ a b "State & County QuickFacts". United States Census Bureau. Retrieved September 27, 2013. ^ "U.S. Decennial Census". United States Census Bureau. Archived from the original on April 22, 2013. Retrieved January 1, 2015. "Bernalillo" . The American Cyclopædia. 1879. This page was last edited on 2 March 2019, at 22:08 (UTC).